For other uses, see Jack Frost (disambiguation). 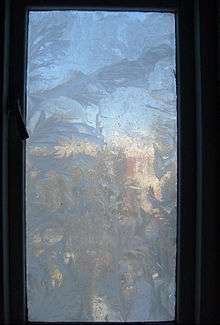 Jack Frost is traditionally said to leave the frosty, fern-like patterns on windows on cold winter mornings (window frost or fern frost) and nipping the extremities in cold weather. So-called window frost has become far less prevalent in the modern world due to the advance of double-glazing, but Jack Frost remains a well-known figure in popular culture. He is sometimes described or depicted with paint brush and bucket coloring the autumnal foliage red, yellow, brown, and orange. He may originate from Anglo-Saxon and Norse winter customs. In Russia however, he has taken on a different form as Grandfather Frost, and in Germany there is instead a different entity altogether. There are various other mythological beings who take on a similar role yet have different folklore to them. Jack Frost has appeared as a character in television and movies. He was mentioned in the wintertime song "The Christmas Song" (aka "Chestnuts Roasting on an Open Fire"). He has been presented as a villain in some media and a hero in others. Hannah Flagg Gould's (1789-1865) poem "The Frost" features a mischievous being responsible for the quieter phenomenons of winter, beautiful ice paintings on windows but who also got upset at lack of gifts and caused the cold to break and ruin things. In Charles Sangster's "Little Jack Frost", published in The Aldine, (Vol.7, No.16, 1875) Jack Frost is a playful being who runs around playing pranks and 'nose-biting', coating places with snow before being chased off by Dame Nature for spring. In L. Frank Baum's The Life and Adventures of Santa Claus (1902), Jack Frost is the son of the otherwise unnamed Frost King. He takes pleasure in nipping "scores of noses and ears and toes", but Santa Claus, who likes Jack (who he sees as a "jolly rogue") though he mistrusts him, asks him to spare the children. Jack says he will, if he can resist the temptation. 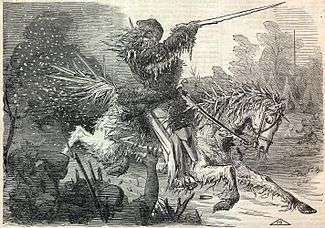 The same Jack appears in "The Runaway Shadows", a short story by Baum. In this story, he has the power to freeze shadows, separating them from their owners, making them their own living entities. In Laurell K. Hamilton's Meredith Gentry series, a character emerges as the original Jack Frost. Jack Frost has appeared as a minor character in the Rupert Bear stories, and in Jack of Fables (a Fables spinoff) the titular character became Jack Frost for a period of time. A second Jack Frost ("Jack too, or Jack two") appears as the son of Jack Horner and The Snow Queen. In the Rainbow Magic books by Daisy Meadows, Jack Frost is an antagonist who wants to freeze Fairyland. He is accompanied by pesky goblins who steal fairies, and try to sabotage them. Jack Frost also appears in "First Death in Nova Scotia", a poem by Elizabeth Bishop. In the novel Hogfather by Terry Pratchett, Jack grows tired of "fern patterns" and paints more elaborate pictures on windows. Jack Frost appears in The Veil trilogy of novels by Christopher Golden. The Man Jack, an enigmatic assassin, calls himself Jack Frost in The Graveyard Book by Neil Gaiman. The Stranger, a picture book by Chris Van Allsburg, stars Jack Frost as a lonely stranger with amnesia. Jack Frost is one of the co-stars of the 2002 novel Jill Chill and the Baron of Glacier Mountain, written by Ed McCray with artwork by George Broderick, Jr. Jack is portrayed as Jill Chill's boyfriend. Jack Frost, an automaton of one of the Ten Benchwarmers in the Unbreakable Machine-Doll light novel. In comic books, Jack Frost appears as a superhero in works published by Timely Comics (now Marvel Comics) in the 1940s. A man covered in ice, he could project ice and cold and is a member of the Liberty Legion. Marvel Comics had a second Jack Frost, the first alias of the original Blizzard. In a Sunday edition of the Hi and Lois comic strip, father Hi, teen-aged son Chip, and young son Ditto are driving to the garden center one Sunday afternoon in late autumn. Ditto asks his father why leaves change color in the fall. "Well," says Hi, "there’s actually a very interesting story behind that…" However, Chip interrupts and gives Ditto the correct scientific explanation as to why leaves change color, which he learned in high school. In the final panel, later that night, a dejected Hi muses to his wife Lois, "I wanted to tell him about Jack Frost and his magic palette." Jack Frost appears in the 2009 comic book Jill Chill & The Christmas Star by Ed McCray and George Broderick Jr., a sequel to the Jill Chill illustrated novel mentioned above. This is a traditional representation of Jack Frost as a teenager. Jack Frost is the alias of Dane McGowan one of the main characters from the 1990s Vertigo series The Invisibles. Jack Frost, an automaton of one of the Ten Benchwarmers in the Unbreakable Machine-Doll manga. Jack Frost, a Russian film from 1964, has the title Morozko—the Russian equivalent of Jack Frost. In the 1997 film Jack Frost, a serial killer turns into a snowman and continues his rampage. This movie spawned a sequel in 2000: Jack Frost 2: Revenge of the Mutant Killer Snowman, also starring this version of Jack Frost. In the 1998 film Jack Frost, Michael Keaton plays a human by the name of Jack Frost, who is killed in a car-crash on Christmas Eve. A year later he returns as a snowman to spend time with his son. Jack Frost appears as the primary antagonist in The Santa Clause 3: The Escape Clause played by Martin Short. In this portrayal, he desires to take control of Christmas and claim it as his own, as he is jealous of the attention and popularity of Santa Claus. His "Frostmas" holiday proposal had even annoyed Santa Claus and the other members of the Council of Legendary Figures (which also consisted of Mother Nature, Father Time, the Easter Bunny, the Sandman, Cupid, and the Tooth Fairy). Jack Frost appears as the protagonist of Rise of the Guardians voiced by Chris Pine. Jack Frost is getting tired of being unseen and is suddenly forced to join the Guardians (which consists of Santa Claus, Tooth Fairy, Sandman, and the Easter Bunny) to defeat the Boogeyman (aka Pitch Black). This version of Frost is portrayed as a fun-loving teenage boy who has no interest in being bound by rules or obligations and just wants to use his magical staff to spread his winter magic for the sake of his amusement, and for the amusement of others. Prior to the popularity of television, Jack Frost appeared in the children's radio serial The Cinnamon Bear. Jack Frost appears as the title character in a 1934 release of Ub Iwerks's ComiColor Cartoons. In television, Jack Frost (voiced by Paul Frees) makes an appearance in the Rankin/Bass Christmas television special Frosty's Winter Wonderland, in which he grows jealous of Frosty the Snowman because of the attention the children lavish upon him. He tries to render Frosty lifeless by stealing his magic hat but is eventually chosen as the best man at Frosty and Crystal's wedding. Jack Frost reappears at the end of the Rankin/Bass TV special Rudolph and Frosty's Christmas in July voiced again by Paul Frees. He helped Rudolph bring Frosty the Snowman and his family back to life after they melted. In another Rankin/Bass TV special produced in 1979, Jack Frost, the title character (voiced by Robert Morse) falls in love with a human girl and seeks to become human. Father Winter grants his wish, but tells him that if he does not have a house, a horse, a bag of gold, and a wife by "the first sign of spring" he will become a sprite again. Jack Frost appears in the American Dragon: Jake Long episode "Eye of the Beholder" voiced by Jonathan Freeman. This version is depicted as a big blue man in a Hawaiian shirt. He appears as a judge of Eli Pandarus' beauty contest alongside Santa Claus and the Tooth Fairy. Jack Frost appears as an automaton of one of the Ten Benchwarmers in the Unbreakable Machine-Doll anime. Jack Frost is the title character of Rise of the Guardians. Jack Frost appears as a monster in AdventureQuest. Jack Frost appears in OverSoul. Jack Frost appears in Killing Floor. Jack Frost appears in City of Villains. Jack Frost appears in Guild Wars. Jack Frost appears in Granado Espada. Jack Frost appears in Rise of the Guardians: The Video Game (which is based on the film of the same name). Jack Frost appears in RuneScape. Jack Frost appears in "The Sims FreePlay". Frost also functions as a trademark character for the game-developer Atlus and as a mascot of the Megami Tensei series, in which it learns mainly Ice skills. Jack Frost also appears as a character in Scribblenauts Unlimited. Jethro Tull has a song titled "Jack Frost and the Hooded Crow". Saint Vitus depict Jack Frost as an evil spirit of winter on their album V.
The radio station WRHS-FM 89.7 in Norridge, Illinois brands its holiday music format "Jack Frost". The name has been employed as a pseudonym by musicians Bob Dylan and Jack Dempsey. At the end of the 1997 Jack Frost film, Scott MacDonald [Jack Frost] plays a segment of "Silent Night"
Jack Frost is also a doom metal band from Austria. The song "Chestnuts Roasting on an Open Fire" by Nat King Cole has the lyric "Jack Frost nipping at your nose". ↑ Bartholomew F. Bland, Laura L. Vookles, William H. Gerdts, Laura L. Vookles. (2010) Paintbox Leaves: Autumnal Inspiration from Cole to Wyeth. Hudson River Museum. p. 41. ISBN 0943651301.Tveten, John L. and Gloria Tveten. (2008). Nature at Your Doorstep: A Nature Trails Book. Texas A&M University Press. p. 47. ISBN 1603440364. ↑ Charles Sangster (April 1875). "Little Jack Frost. A Rhyme for Flossie": 308. JSTOR 20636992.